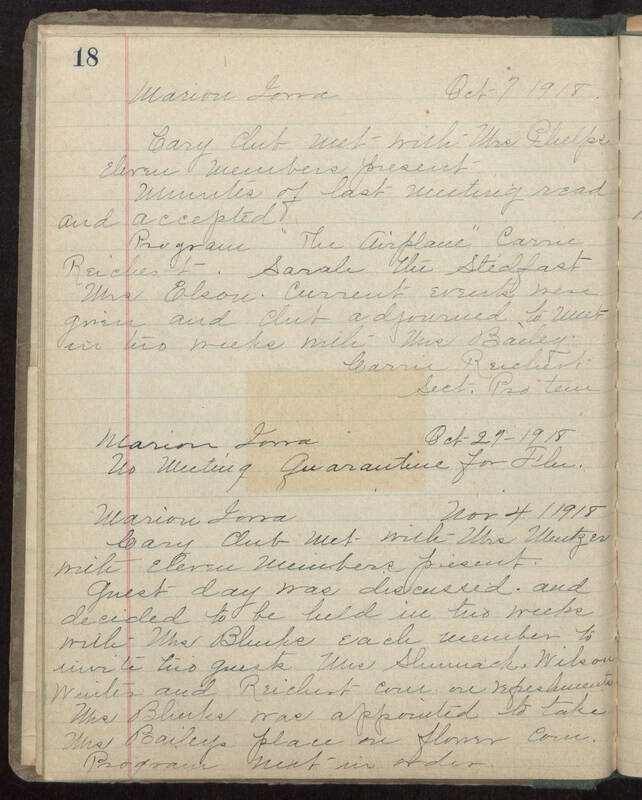 Marion, Iowa Oct 7, 1918 Cary Club met with Mrs. Phelps. Eleven members present. Minutes of last meeting read and accepted. Program "The Airplane" Carnie Reichert. Sarah the Stedfast, Mrs. Elson. Current events were given and club adjourned to meet in two weeks with Mrs. Bailey. Carrie Reichert, Sect. Pro Tem Marion, Iowa Oct 27,1918 No Meeting Quarantine for Flu. Marion, Iowa Nov 4, 1918 Cary Club met with Mrs. Meutzer with eleven members present. Guest day was discussed and decided to be held in two weeks with Mrs Blinks. Each member to invite two guests. Mrs. Shumack, Wilson, Waites and Reichert [cover?] on refreshments. Mrs. Blinks was appointed to take Mrs. Baileys place on flower cover program next in order.